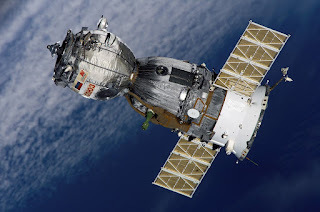 Links Through Space: Soyuz, the real Union in Space! The Soyuz ( meaning union) spacecraft has been a merit to Russian space engineering. This spacecraft has been reliable for over 4 decades. It is still used today as the prime spacecraft to bring astronauts and supplies to the International Space Station. Since 1967 the module has permitted Mankind to access space around Earth and improve space faring for future generations. The Soyuz spacecraft is launched by the Soyuz rocket, the most frequently used and most reliable Russian launch vehicle to date. The Soyuz rocket design is based on the Vostok launcher, which in turn was based on the 8K74 or R-7A Semyorka, a Soviet intercontinental ballistic missile. Soyuz spacecraft are launched from the Baikonur Cosmodrome in Kazakhstan.